Lathe. Yes, metal lathe is one of the foundational components to a strong and flexible deck coating. Perhaps you are wondering what lathe is…you have come to the right place! Prestige Decking is an expert lathe installer…Have you ever wondered what is underneath a deck waterproofing system? What makes it so strong? Flexible? The answer might be surprising to some. In order to bond a waterproof decking system, you need a bridge. Lathe is exactly that. A sturdy base is accomplished in the 3/4 inch plywood sub-floor. Polymer modified concrete need something more adhesive to bond to than wood though. Lathe Installation. We staple down 2.5 lb. galvanized metal lathe with heavy duty one inch crown staples. This gives our concrete layer a porous surface for proper bonding. It also achieves a delicate balance between flexibility and strength. Your anchored deck can flex and not crack! We make to flattened all the staples to ensure an even surface on which the concrete layer sits. This crucial step in the waterproofing process must be installed correctly, or the remaining layers are in jeopardy of waterproof capability. Tile Underlay. We recently finished a job where we prepared the deck for a tile overlay. Whether performing our signature layer Crete Decking System or preparing your deck coatings for custom tile with AVM 750 (see right), we have you covered! After applying our two layers polymer modified concrete and one layer of fiberglass and bonder, your deck repair project is ready for the tile overlay of your choice. Prestige Deck Coating is your Orange County based lathe expert! We have foremen with up to 40 years experience. We offer free estimates. 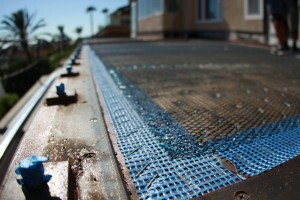 Our waterproofing packages offer up to a ten year warranty. We value customer care, expert installation and quality products. Check out our you tube page! ← All Hands on Deck in Aliso Viejo!